A pointless, tired, sugary, pink and teal affront to Reese Witherspoon, Bob Newhart, any important political cause...Mr. Smith Goes to Washington, and—oh, let's just say it—humanity. 105 min. MGM. Director: Charles Herman-Wurmfeld. Cast: Reese Witherspoon, Sally Field, Regina King, Jennifer Coolidge, Bruce McGill. Let me make this simple. Jennifer Coolidge has the Midas touch. As Legally Blonde 2's hairdressing bombshell Paulette Bonafonté, Coolidge nails a series of one-liners (like the blithely perky political double entendre "Who's ready to discharge?") with characteristic élan. 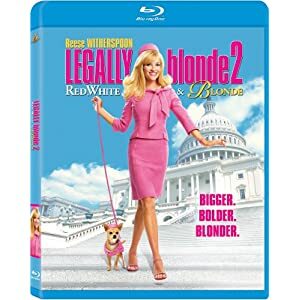 The rest of Legally Blonde 2 is a pointless, tired, sugary, pink and teal affront to Reese Witherspoon, Bob Newhart, any important political cause (including the film's cause of ethical treatment of animals), Mr. Smith Goes to Washington, and—oh, let's just say it—humanity. One offense at a time...Reese Witherspoon elevated the flimsy frame of 2001's Legally Blonde to amusing high camp with her perky take on sorority sweetheart Elle Woods. With telling haste, MGM turned around this emaciated pseudo-remake grafted onto a thuddingly obvious remake of Frank Capra's classic Mr. Smith Goes To Washington, but with a Chihuahua. The Chihuahua—named Bruiser Woods—is pivotal to the story, especially the stultifying fifteen minutes which open the film, which had me literally thinking to myself, "What the hell?" That it was all downhill from there should give you some idea of how far below Witherspoon the movie is pitched. Suffice it to say that events conspire to send Elle from her Boston law firm to Washington, D.C., where Congresswoman Victoria Rudd (Sally Field, on autopilot) greets her with open arms. Like much of the film, Rudd's relationship to Woods--at times gushing, at times cold--shifts to the convenience of the plot without ever serving a realistic internal logic. Bob Newhart plays the unassuming hotel doorman who knows all; unfortunately, he is made at one point to talk like Snoop Dogg for a cheap laugh. Dana Ivey and Bruce McGill play power players who Elle must sway to her cause, and the ubiquitous Luke Wilson returns as Elle's fiancé. Like the sorority sisters of Legally Blonde, Rudd's smooth staffers take an immediate dislike to the blissfully ignorant Elle, except for the mousy one, who warms to Elle's kindness. Ho hum. With an overtly gay sensibility, Legally Blonde 2 outs a recurring character, makes endless jokes about fashion and pinking shears, and takes glee in bitchiness. Mr. Smith Goes to Washington turns up on a TV, not long before Elle makes a despondent visit to the Lincoln Memorial. Putting aside the glorification of Woods's guileless dimwittedness, writer Kate Kondell and director Charles Herman-Wurmfeld also insult women by having giggly female representatives trade votes for free makeovers. Another sequence asserts that the usefulness of sorority girls is gabbing on the phone, to the tune of "Sisters Are Doin' It for Themselves." A series of lamebrained gags and musical selections (the soundtrack includes "For What It's Worth" and "Power to the People" alongside a rockin' cover of "I'm Just a Bill") trivialize real and serious political struggles. Elle's platitudinous wisdom runs to "I forgot to use my voice. I forgot to believe in myself" and "You can do it the Washington way. I'm going to do it the Elle Woods way." Thus begins the post-democratic era. MGM's recent flurry of budget catalog titles may or may not have something to do with the brand-name studio's financial and legal woes, but it's fair to say that some of the releases have been "quickie" in nature. That's true of Legally Blonde 2: Red, White & Blonde, a sequel rather randomly released before its predecessor. The A/V quality leaves something to be desired, though it's a step up from DVD: the hi-def image runs to the soft and waxy, though the candy colors are bold and detail moderately improved from the DVD (which most likely sported this same hi-def transfer, just in standard def). The DTS-HD Master Audio 5.1 mix is also a moderate improvement, and while one shouldn't expect anything spectacular, it's certainly adequate for the demands of the film. Bonus features return, starting with a weird and sorta wonderful audio commentary with Jennifer Coolidge, Jessica Cauffiel, and Alanna Ubach—wonderful, that is, if you love Jennifer Coolidge (which I do). Seven "Deleted Scenes" (9:31, SD) include an alternate opening. Making-of featurette "Blond Ambition" (22:27, SD) serves up B-roll, cast and crew interviews, and film clips. "Pretty in Pink" (6:36, SD) focuses on production design, while "Stars and Stripes, Never!" (7:35, SD) deals with costume design and "Hair Apparent" (6:56, SD) examines hairstyles. "Elle's Anthem" (7:13, SD) finds composer Rolfe Kent chatting about his work. Also on hand: the "Gag Reel" (2:39, SD), dog-centric "Puppy Love" (2:24, SD), dog gag clips "Bruiser's Outtakes" (1:27, 1:01, 0:29, 0:24, SD), "Music Video 'We Can' by Leann Rimes" (3:41, SD) and the "Theatrical Trailer" (2:12, HD). All site content © 2000-2019 Peter Canavese. Page generated at 04/25/2019 02:56:53PM.